Walking into Chonde village, 10km from the main trading centre, 4 women are sitting on a mat chatting their day away. Joining their conversations, I realise the women were not just having a normal chat but they are part of the Water Point Committee. The committee for Chonde Village is comprised of 5 women and 5 men. The committee have just been through refresher training recently which was carried out by extension workers with supervision by Pump Aid Staff. So far, K6500.00 (roughly £7) has been raised by the committee for the maintenance fund which will be used if any repairs are needed for the pump. Prior to the pump being built, Chonde village use to drink water from a nearby swamp. The water was smelly and had a milky colour. Every household use to get water from the swamp for daily use; however the trips to the swamp were not easy due to the long distance and so only limited amounts of water could be collected. As the water from the swamp in not protected the chances of water borne disease is very high. 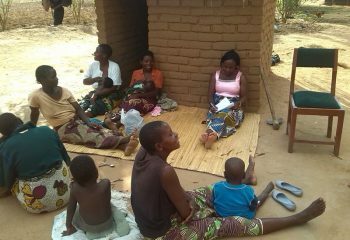 Diarrhoea cases were common and what little money households had was spent on going to see the physicians. There was no time for women to get together for a chat or do household chores because if they were not visiting the physician they were then busy fetching water. This changed once Pump Aid arrived. The community facilitator assessed the needs of the community and water supply was identified to be one of the village’s main needs. They began engaging the community through the village headman and asking the community to make contributions in form of labour, sand and bricks. 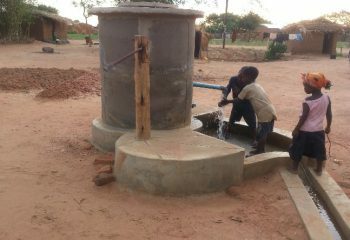 When the resources were formed and the village were organised, the Pump building team came into the village to install the pump. During the installation, some of the beneficiaries took part in helping the team to build the pump thereby learning how the pump functions. In addition to construction the Elephant Pump, Pump Aid also promoted good hygiene and sanitation behaviours among the beneficiaries. This involved encouraging the community to have a latrine per household to reduce diarrhoea cases. In the village Pump Aid spoke to Mr Peter Chonde and asked him why it is important to have a latrine per household, “munthu umadzisungila ulemu wako ukakhala ndi chimbudzi” he responded meaning when your household has a latrine, you have privacy and dignity. In addition to having a toilet, the four women also emphasised the importance of storing the water in a clean container. “The first thing I do when I am filling my water bucket is to clean the bucket with soap or ash if I don’t have soap so that my water is clean” said Noriah Chonde. Noriah Chonde a sister to Peter Chonde works at Exagris Farm and her monthly pay provides for her daily needs. She also has her own piece of land where she grows maize and groundnuts for food. 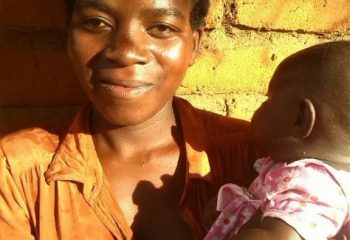 Finally, Mercy and Ellen who both had babies said that they can now wash their hands before they breastfeed their babies and after changing the babies nappy. In addition, they said “we make sure that the babies’ poo is thrown into the pit latrines to keep the flies away from our houses.” This was very encouraging to hear such messages from these mothers as it shows that Pump Aid’s behaviour change programme has been effective.